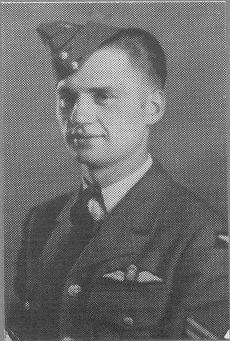 John Allen Parker of Minnedosa Manitoba, enlisted in the RCAF in 1941, Posted to the Brandon No.2 Manning Depot in his native Manitoba. On completion of his training there he was posted to Initial Training School No.4 at Edmonton Alberta. LAC Parker continued his flight training back in Manitoba at No.19 Elementary Flying School in Virden flying the agile little Tiger Moth as his training aircraft. LAC Parker was involved in a training accident during this time. During night flying exercises the aircraft crashed killing the instructor. His flight training was allowed to continue and he completed the E.F.T.S. course and moved on to a posting with No.4 Service Flying Training School at Saskatoon. Graduating from this course on twin engine aircraft and receiving his wings and promotion to Sergeant on November 6, of 1942. As Sergeant Parker, he and his crew flew on their first Operation for 419 squadron on September 27th headed for Hannover. It was not an ideal first operation on the way there the "Gee" system burst into flames and they also lost their DR unit. Unable to proceed they returned to base. The next three operations were completed with no notes on problem, but fifth operation saw problems with the rear gun turret becoming inoperable and a danger to aircraft from rear attacks. The next operation which was to be Mannheim saw not only his aircraft but several others overcome with icing problems. In addition to the normal problems caused by icing his aircaft now had an incendiary bomb hung up in the rack. No mention if the problem was resolved before landing or if they landed with a very dicey situation of a bomb becoming undone when the Halifax hit the runway on landing. Several other operations to such targets as Leverkusen and Frankfurt passed before another icing problem resulted in having the right landing gear stuck in the down position, this mission to Leipzig was terminated. At the beginning of February it was becoming clear to Bomber Command that the Halifax was no longer a front line quality bomber and so by the end of the month the Halifax was designated the status of second line aircraft. This would not save F/S Parker and his crew as the decsion was made later in the month. They noted in the log that the operation of February 12/13 was an uneventful run. The crew had not been on any operations before this February 12/13 operation since night of December 3/4. Now coming up was a large scale raid on Berlin. On the night of February 15/16 Halifax JD456 and Parker's crew along with 890 other bombers were involved in the largest raid ever on Berlin. The large force was mainly made up of Lancasters but still having over 300 Halifax aircraft assigned to the operation. A fake attack on Frankfurt failed to work to Bomber Commands advantage with the result of the loss of 43 heavy bombers and many crew men. No exact cause is listed for the loss of JD456, night fighters were heavily involved over the city of Berlin even with their own flak blasting away at the bomber formations fighters were observed weaving in and out of the target area. All that is known is that the crew came down in the sea South of Langeland Denmark. Only three bodies were recovered, those of P/O Donald, F/S Fournier and Sgt. Raine. The body of P/O John Parker was never found, he was 23. Parker Creek in Manitoba is named after him.